I recently returned from My 33-day pilgrimage to India, a trip that has changed My life in so many ways, and is sure to change this ministry as well. Our trip was a symphony of one miraculous, God-filled moment after another. So many surprises…. So many times God left His signature upon a magical moment. There is so much that happened, it could fill an entire book. We have put together a small slide show to share with you. 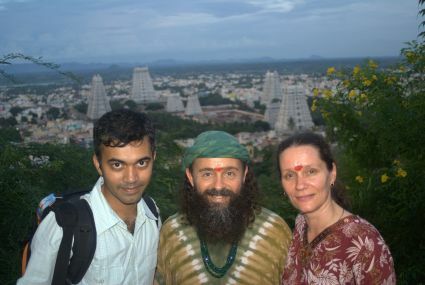 Our journey took us all over India, visiting the mahasamadhi shrines (tombs) of many of the Avatars who have been an instrumental part of My training and/or this ministry over the years. This trip was to not only pay My respects to these Great Ones who helped mould and shape My life, but to directly receive their darshan as well. 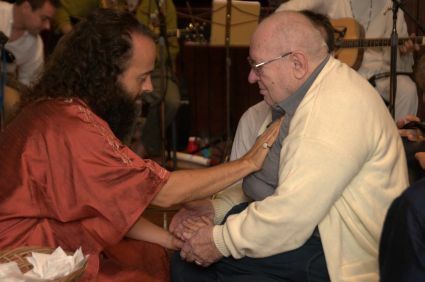 It was so wonderful to be able to sit at their feet, in the ashrams and centers where they lived and served all the days of their lives. Driving by car for much of this trip, we were fortunate to see much of the countryside and meet so many people. Needless to say, the pilgrimage far exceeded anything I could have imagined, and I am eternally grateful to every one of you who helped to create or support this trip. As we are now in the final month of this Year of Adoration, I hope that many of you took full advantage of the Revelations and insights I shared last New Year’s Eve, ones that would help you create the most blissful, peaceful, and successful life possible. I pray that you made the time to deepen and re-create your relationship with God/the Divine and that you are now harvesting the blissful fruits of that investment in your Self. December 17th (Friday), 6:30 - 10:30 p.m. This event takes place on Louix's birthday, as He sets aside this special day to shower upon us His love and personal blessing. It is widely known that the two most powerful days to receive the darshan of a living Master are the day of His birth and the day of His liberation/enlightenment. Come and experience the transformational power of Louix's unconditional love. For the first time in twelve years, Louix's traditional New Year's Eve Retreat will be held in the United States. Be transformed by His darshan and drink of His ageless wisdom over the course of five intimate and engaging days with this spiritual Master. July 25th was Guru Purnima, the traditional Hindu day of revering and celebrating the Guru. 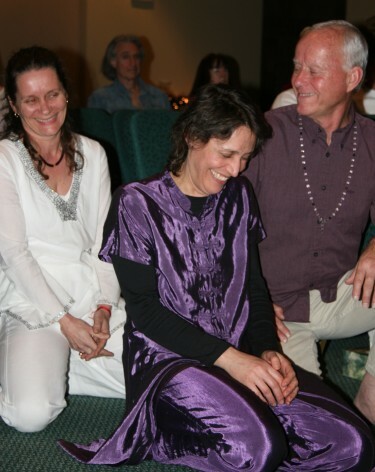 On this holy day, the community at Prema Drala Ashram gathered to honor Louix with a traditional Indian-style ceremony. We began the event by singing devotional songs, and by placing around His neck a garland made of carnations. We then performed an aarti ceremony, part of which included each disciple coming before Guruji and tenderly washing and anointing His feet. 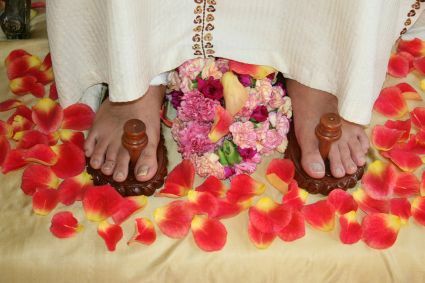 Once this beautiful act of devotion was complete, we presented Guruji with a pair of padukas (wooden sandals traditionally worn by holy beings), a special gift which had been acquired from India. 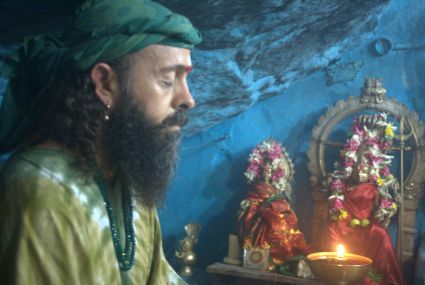 During this ceremony we played a recording of disciple Shree Narasimhulu singing the 108 Names of Bhagavan Sri Pranananda (a project that he created and composed). 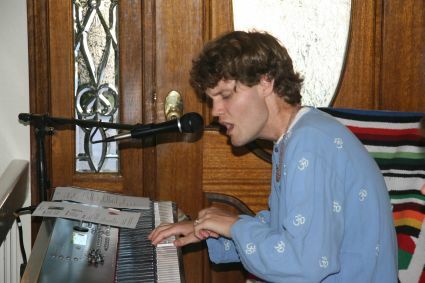 Finally, Peter DeWitt sang “Song to The Beloved,” a song expressing one’s Divine Romance with The Beloved, which he recently composed for the occasion. 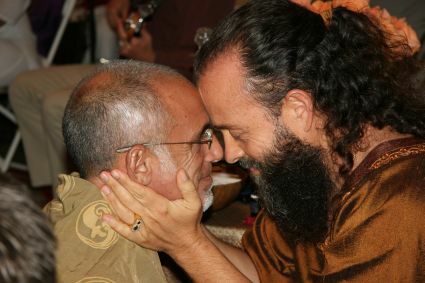 On August 21st, Guruji and Pranam led 30 people during an ecstatic evening of devotional singing at Prema Drala Ashram. On August 25th, Louix and His team returned to Las Vegas to hold two events at Sun City McDonald Ranch in Henderson, NV. 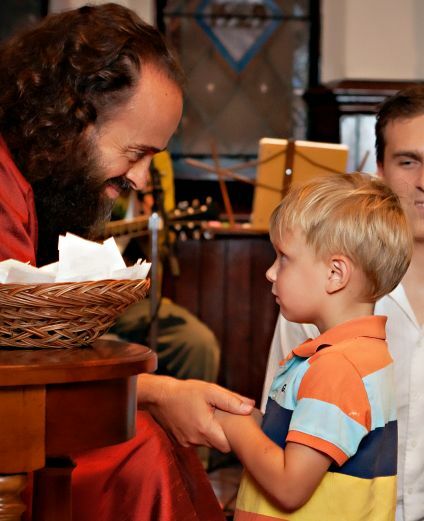 On August 25th, Guruji gave darshan to approximately 75 people while Pranam serenaded the room with devotional music. On August 28th, Louix gave a discourse on “The Art of Self-Inquiry." He also discussed various topics, including: complacency, the collective awakening of the planet, surrender, and how children are our greatest teachers. 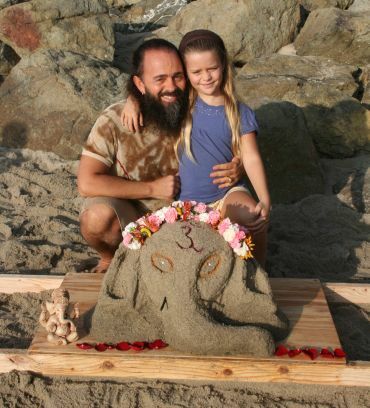 On September 11th, Louix, His daughter Ariel Ganesha, and the disciples gathered at Aliso Beach in Laguna Beach, California to celebrate Ganesha Chaturthi. Everyone worked together to sculpt a bust of Lord Ganesha out of wet, compact sand. We then held a ceremony for the deity by having each person come before the bust and adorn it with a special token (from Mother Nature) of their love and devotion. We sang several beautiful devotional songs to Lord Ganesha, to deepen our Divine attunement and to further invoke Ganesha's holy presence (which was quite palpable to all!). 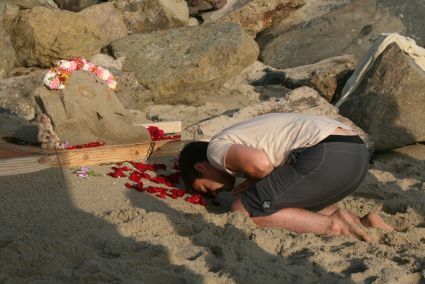 Finally, as the sun began to set, we carried the sculpture to the ocean where, just as in the traditional rituals held in India, the waters carry Ganesha back home. 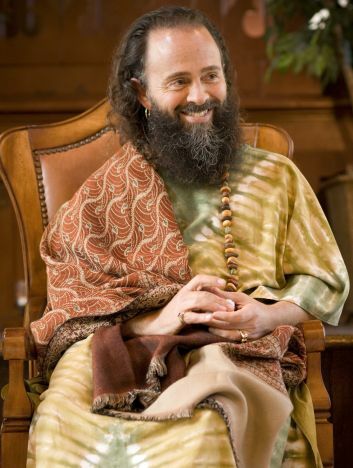 On September 15th, Pranananda gave darshan at the Rose Temple in Venice, California. 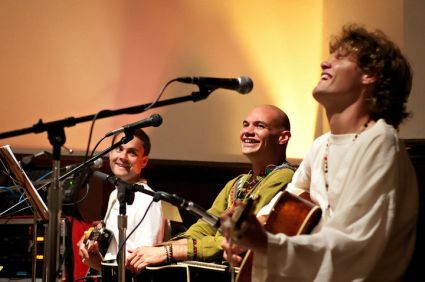 Pranam was joined by two members of the Australian kirtan band Sushumna, as they played an electrifying set of devotional music. Over 130 people received darshan, some of whom were passers-by who were encouraged to come in by the those leaving the event! 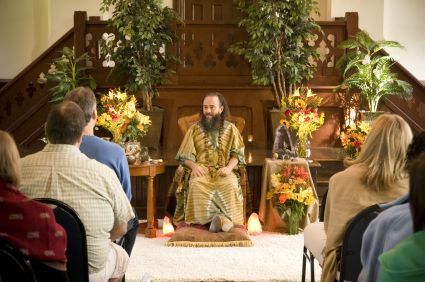 On September 23rd, Louix held his first event in Racine, Wisconsin (a city half-way between Milwaukee and Chicago) giving darshan to over 125 people---most of whom had never been in the presence of a spiritual Master. 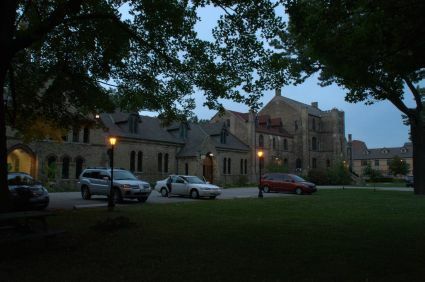 The event was held at the beautiful and historic DeKoven Center, a retreat center on the shores of Lake Michigan. 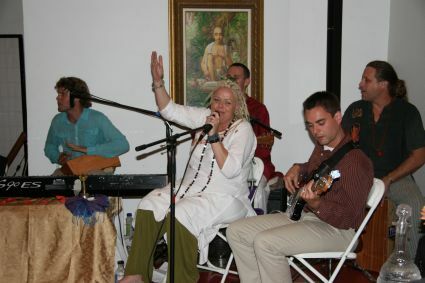 Pranam was also invited and flown out from Southern California to play at this specific event. It was a touching scene to watch the children sit around Louix, gazing adoringly at Him for most of the evening. On September 26th, approximately 40 people attended a One-Day Retreat with Louix, also held at the DeKoven Center. He started with a meditation about the fairies watching over each of us, which evolved into an exquisite ceremony that summoned, from within, each person's own fairy energy. 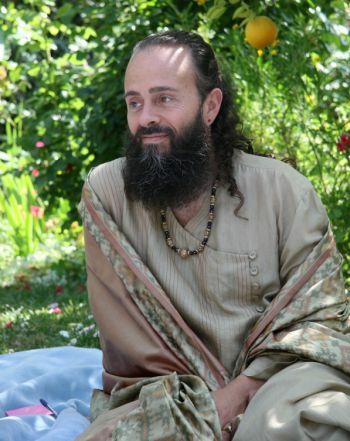 Throughout the day, Guruji counseled each soul on many topics, that included: children’s emotional bodies, tools to invoke gratitude into our lives, guidance for parents with autistic children, and many other topics. 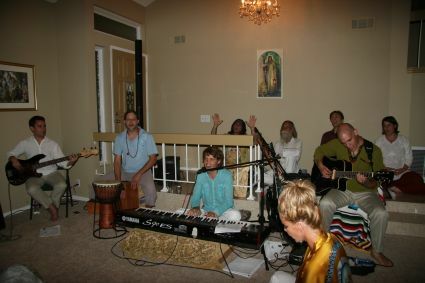 On October 8th, Louix gave darshan at the Seaside Center for Spiritual Living in Encinitas, California---His debut event in a beautiful coastal town with a thriving spiritual community! About 100 people attended the event, which was a great success. Pranam played devotional music in the background, and the crowd joined in the singing, creating an exuberant atmosphere of joy and devotion. 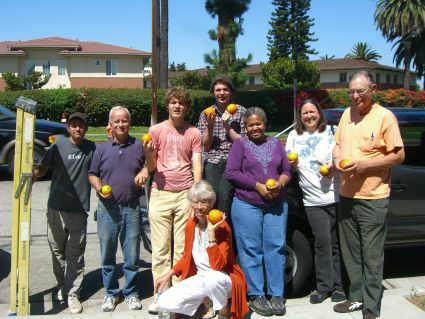 On October 24th, six disciples arrived at the Ronald McDonald House in the City of Orange (in northern Orange County, California) to prune and care for their grove of Valencia orange trees. We removed a tremendous amount of dead wood from the trees, improving the trees' health and enriching next year’s harvest. 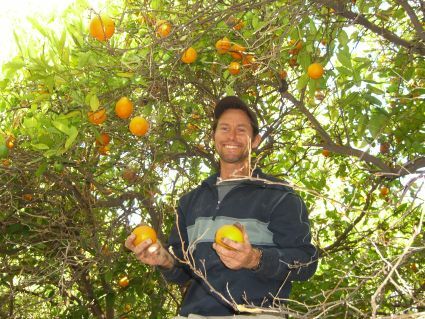 The orchard, which is owned by the House, had already been irrigated, but no fruit harvesting or pruning had taken place until the Foundation's volunteers started these activities over the last two years. Date and Time: December 22nd, at 7:30 p.m. The Life Connection: Feature interview with Louix in the October issue of this San Diego magazine. The Monthly Aspectarian: Article by Louix in the October issue of this Chicago magazine. Vison Magazine: Article by Louix in the November issue of this California, Arizona, and Hawaii magazine. 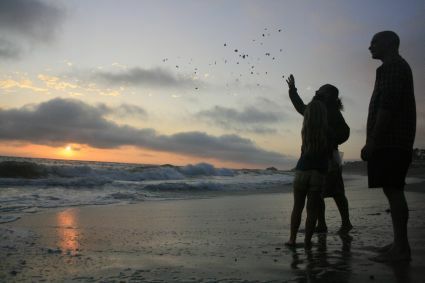 The Life Connection: Article by Louix in the November issue of this San Diego magazine. Join Louix Dor Dempriey on live teleconference calls, which are available to anyone worldwide. These calls, which include discourses, Q&A, and the practice of sacred spiritual tools, are recorded and made available to registrants for future listening. Cost: $20.00 per call; $35.00 for two calls; or $30.00 for a monthly subscription. When: The first and third Thursday of every month, 6:00 - 7:00 p.m. Pacific Standard Time (PST). During this phase of growth and expansion, there are many opportunities to serve the Foundation. To learn more about volunteer opportunities and various service projects, please contact Zimmaron Zsido at (888) 288-3735 or zimmaron@Louix.org (U.S. and other regions), or Kharananda Mayi at +61 3 9885-2993 or kharananda@Louix.org (Australian inquiries). We are so grateful to all those who have donated to the Louix Dor Dempriey Foundation. This Foundation is funded primarily by tithing, donations, and philanthropic offerings to help us fulfill our goal in service to humanity. To make a love offering to the Foundation, please click here. Thank you for your loving support of the Louix Dor Dempriey Foundation! If you would like to host Louix or help coordinate an event in your area, please contact Zimmaron Zsido, Events Coordinator. To schedule an interview with Louix, publish His teachings, or discuss media opportunities, please contact Samantha Farber, Director of Public Relations.